Wiliness, evasiveness, confusion, lukewarmness: the work of Nichols, Archbishop of Laodicea. No, the whole text is a sad exercise in deception: the "Soho Masses" are about the promotion, "advocacy", and celebration of "lifestyles". Allowing them is disastrous - equivocation and tergiversation about their content, when it is there for all to see, is unworthy of any honest human being, cleric or layman, and gravely disrespectful of the Holy See. Clerics in the Westminster diocesan chancery, allow and promote evil and perverted things at your own spiritual peril - but, please, do not treat your fellow Catholics as gullible simpletons. We encourage the Bishops, then, to provide pastoral care in full accord with the teaching of the Church for homosexual persons of their dioceses. No authentic pastoral programme will include organizations in which homosexual persons associate with each other without clearly stating that homosexual activity is immoral. A truly pastoral approach will appreciate the need for homosexual persons to avoid the near occasions of sin. Enough is enough. Adesso basta con questa vergogna! A Londra, la messa "Pride"
Eminentissimi signori Cardinali! Eccellentissimi signori in Curia! Guardate questo video - e l'incredibile difesa di mons. Nichols. Scandalizzati, aspettiamo il Vostro intervento per fermare questa vergogna che succede regolarmente nell'Arcidiocesi di Westminster, centro del cattolicesimo inglese - e che avrà ripercussioni in tutta la Chiesa. È uno scherno a Nostro Signore Gesù Cristo, al Redentore Immacolato, alla Sua Croce, al Suo Santissimo Corpo, al Suo Preziosissimo Sangue, a Sua Madre Immacolata, ai Suoi Angeli e Santi, alla Sua Santa Chiesa di tutti i tempi e luoghi e alla Sua Dottrina perenne. Non girate lo sguardo. Vi preghiamo di fare qualcosa subito – la nave sta andando a fondo. Chiediamo questo con rispetto filiale. Non permettete che questa sciagura continui. Questo distrugge l’unità con Pietro (da San Pietro fino a Benedetto XVI) più di migliaia di discussioni dottrinali irrisolte. What does the future hold for Traditional Catholics in Detroit? Palm Sunday 2008 in Assumption Grotto, Detroit. Source. Long Term Impact on Traditional Catholics in Detroit? One of the things I have been concerned with all along is that there is no provision to ensure that the Archdiocese of Detroit has a long-term plan for Catholics attracted to the Traditional Latin Mass (TLM). There is interest among some seminarians and I believe Archbishop Vigneron will work to address this. In the future, it could mean more opportunities in the suburbs to experience the TLM. One of the challenges though, is allowing people to follow the full calendar, rather than having just a weekly or monthly chance to worship in this way, if they are partial to it. The ribbon in the corner indicates that we are in the Ember Days in Lent - the first one being this Wednesday, whose Gospel is dedicated to the signs demanded from the Lord by Scribes and Pharisees. Fr. 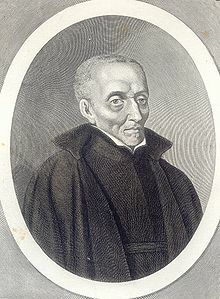 Nicolas Caussin, S.I., confessor to Louis XIII exiled by Cardinal Richelieu and heavily criticized by many Jansenists, is well-known as the author of "La Cour Sainte" ("The Holy Court"). In his "Entretiens" ("Entertainments") for Lent, some of his sermons for the Season are presented in a devotional format: an examination of the traditional scriptural readings for the day in the Roman Rite followed by the aspirations of the soul thirsty for Christ. He will be our main inspiration for seasonal posts this year. It is a very ill sign when we desire signs to make us believe in God. The signs which we demand to fortify our faith are often marks of our infidelity. There is not a more dangerous plague in the events of worldly affairs than to deal with the devils or to play with predictions. All these things fill men with more faults than knowledge. For divine oracles have more need to be reverenced than interpreted. He that will find God must seek him with simplicity and possess him with piety. Agnus Dei and Regina Caeli Councils of the Knights of Columbus are sponsoring a Pontifical Mass for Life on the Feast of the Annunciation at Manhattan’s Church of the Holy Innocents. His Excellency, James C. Timlin, bishop emeritus of Scranton, will celebrate the Pontifical Mass and administer Confirmations in a separate ceremony beforehand. This Pontifical Mass is one event in the Knights of Columbus’ international observance of “The Day of the Unborn Child” on the Feast of the Annunciation. Throughout the world, Knights of Columbus councils mark the day by attending Mass, praying the Rosary, and speaking out against the evil of abortion and in favor of all unborn children and their mothers. For the first time since 1996, and only the fourth in the past 80 years, the relic traditionally believed to be the Holy Tunic of the Lord (the "seamless garment" worn by the Lord in his Passion) will be on display in Trier (Rhineland-Palatinate), Germany, from April 13 to May 13. And, this year, there will be a special pilgrimage of Traditional Catholics from April 20 to April 22 with Cardinal Brandmüller. At the pilgrimage of these communities, all liturgies are celebrated in the traditional Latin form. ... The only sepulcher of an apostle on the northern side of the Alps, St. Matthias, is located in the Basilica, which is named after him. As organizer of the pilgrimage of the Ecclesia-Dei Communities, I cordially invite you in the name of all those communities to the Holy Tunic Pilgrimage from April 20th to April 22nd 2012. Please come in great numbers. The Diocese of Chur, in central-eastern Switzerland, announced today the canonical erection of two Personal Parishes dedicated to the Traditional Roman Rite (the Extraordinary Form of the Roman Rite), as envisaged by Summorum Pontificum, art. 10. 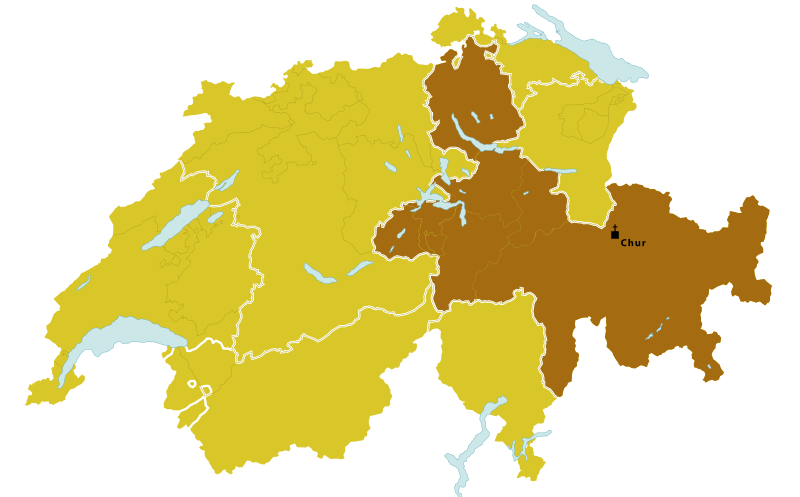 Bishop Vitus Huonder established the Personal Parish Maria Immaculata in Oberarth (Canton Schwyz) and the Personal Parish of Saint Maximilian Kolbe, in Thalwil (Canton Zurich - staffed by priests of the Fraternity of Saint Peter/FSSP), both for preexisting communities of Traditional Catholic faithful. The decrees were signed on Feb. 22 and were made public today. 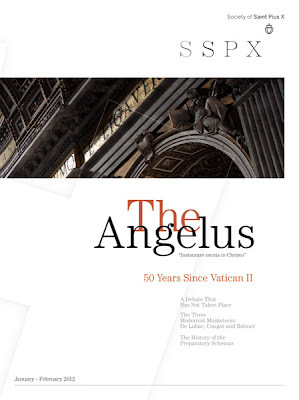 We are deeply thankful to The Angelus for having agreed to let us post this article published in their Jan.-Feb. 2012 issue, the first one in their new beautiful format (the inside pages include some particularly impressive images of the Vatican Basilica). It clearly strikes the right balance between a formal journal and a source of useful information for any Catholic reader. The issue is in part dedicated to the great historic event of the year, the 50th anniversary of the opening of the Second Vatican Council. In the development of the Council, no documental matter was of greater consequence than the "schemata" (the "drafts") of the Conciliar documents - whose smooth acceptance would probably have allowed for a Council in the general line followed by Blessed John XXIII in the Roman Synod and in Veterum Sapientia - and their rejection by the maneuvers of the organized "Progressive" minority of Fathers and their experts (periti). The first session of the Council, in 1962, with no approved documents, turned out thus to be its most influential. "After-birth abortion: why should the baby live?" Moralities. Behold here a gospel of great terror, where our spirit, like the dove of Noah, is placed upon the deluge of God's wrath, and knows not where to find footing. Everything is most dreadful, but what can be more terrible than the certainty of God's judgment, joined with the great uncertainty of the hour of our death? It is an unchangeable decree, that we must all be presented before the high tribunal of the living God, to render a just account of all which our soul has done while it was joined with our body, as we are taught by St. Paul. We must make an account of our time spent, of our thoughts, words, actions: of what we have done, and what we have omitted; of life, death, and of the blood of Jesus Christ; and thereupon receive a judgment of everlasting life or death. "... in all circumstances as God’s ministers..."
"Behold, now is the acceptable time; behold, now is the day of salvation! We give no offense to anyone, that our ministry may not be blamed. On the contrary, let us conduct ourselves in all circumstances as God’s ministers, in much patience; in tribulations, in hardships, in distresses..."
Some groups, on the other hand, openly accused the Pope of wanting to turn back the clock to before the Council: as a result, an avalanche of protests was unleashed, whose bitterness laid bare wounds deeper than those of the present moment. "...in stripes, in imprisonments, in tumults; in labors, in sleepless nights, in fastings; in innocence, in knowledge, in long-sufferings..."
I was saddened by the fact that even Catholics who, after all, might have had a better knowledge of the situation, thought they had to attack me with open hostility. "...in kindness, in the Holy Spirit, in unaffected love; in the word of truth..."
[S]ome of those who put themselves forward as great defenders of the Council also need to be reminded that Vatican II embraces the entire doctrinal history of the Church. Anyone who wishes to be obedient to the Council has to accept the faith professed over the centuries, and cannot sever the roots from which the tree draws its life. "...in the power of God, with the armor of justice on the right hand and on the left..."
Was this measure needed? Was it really a priority? Aren’t other things perhaps more important? Of course there are more important and urgent matters. ... In our days, when in vast areas of the world the faith is in danger of dying out like a flame which no longer has fuel, the overriding priority is to make God present in this world and to show men and women the way to God. Not just any god, but the God who spoke on Sinai; to that God whose face we recognize in a love which presses "to the end" (cf. Jn 13:1) – in Jesus Christ, crucified and risen. The real problem at this moment of our history is that God is disappearing from the human horizon, and, with the dimming of the light which comes from God, humanity is losing its bearings, with increasingly evident destructive effects. Can we simply exclude them, as representatives of a radical fringe, from our pursuit of reconciliation and unity? What would then become of them? ... [S]hould not the great Church also allow herself to be generous in the knowledge of her great breadth, in the knowledge of the promise made to her? Should not we, as good educators, also be capable of overlooking various faults and making every effort to open up broader vistas? And should we not admit that some unpleasant things have also emerged in Church circles? "...as sorrowful yet always rejoicing, as poor yet enriching many..."
"...as having nothing yet possessing all things." Mary teaches us trust. She leads us to her Son, in whom all of us can put our trust. He will be our guide – even in turbulent times. And so I would like to offer heartfelt thanks to all the many Bishops who have lately offered me touching tokens of trust and affection, and above all assured me of their prayers. My thanks also go to all the faithful who in these days have given me testimony of their constant fidelity to the Successor of Saint Peter. May the Lord protect all of us and guide our steps along the way of peace. This is the prayer that rises up instinctively from my heart at the beginning of this Lent, a liturgical season particularly suited to interior purification, one which invites all of us to look with renewed hope to the light which awaits us at Easter. In this Lenten season, some among our friends have taken the initiative of offering up their struggles and sacrifices for reconciliation and unity between all Catholics. At a moment in which the dialogue between the Society of Saint Pius X [SSPX] and the Holy See reaches a decisive point for the future, the District of France [of the FSSP] encourages its friends to double their fervor in prayer. P.S. reading material to enrich our meditation: the Message of Benedict XVI for Lent. 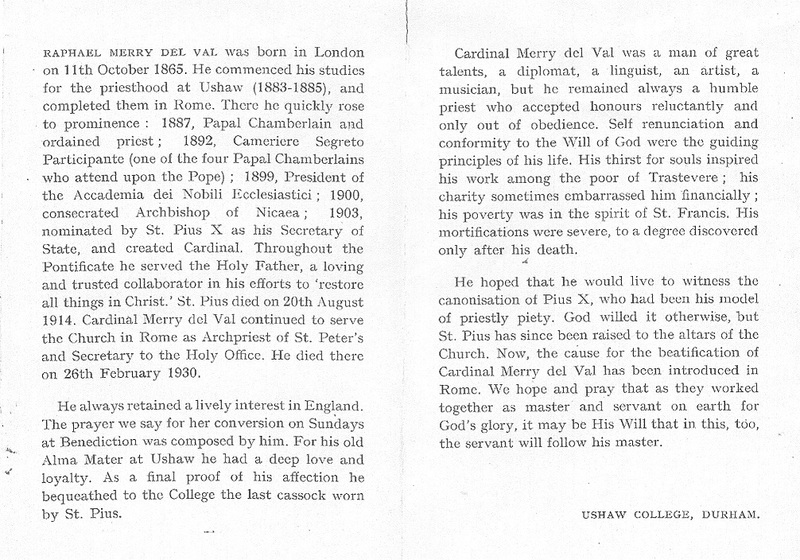 As has been stated in Rorate, Rafael Merry del Val was educated at Ushaw College in the north of England. 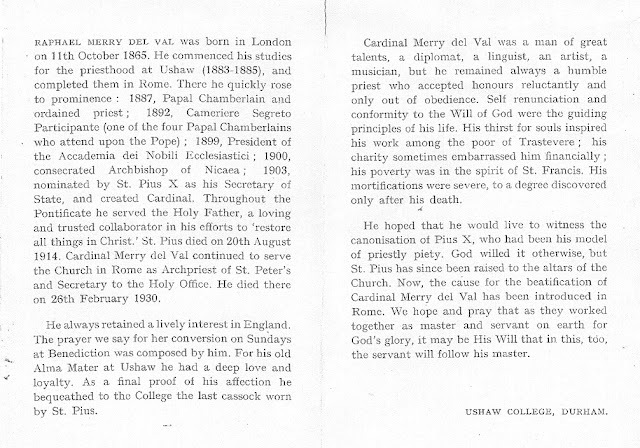 He commenced his studies at Ushaw College in 1883 before he went to Rome in 1885. In 1955, the Bishop of Hexham and Newcastle, in whose diocese Ushaw College is situated, wrote to the people of the diocese and asked them to support a novena to further the cause of His Eminence. 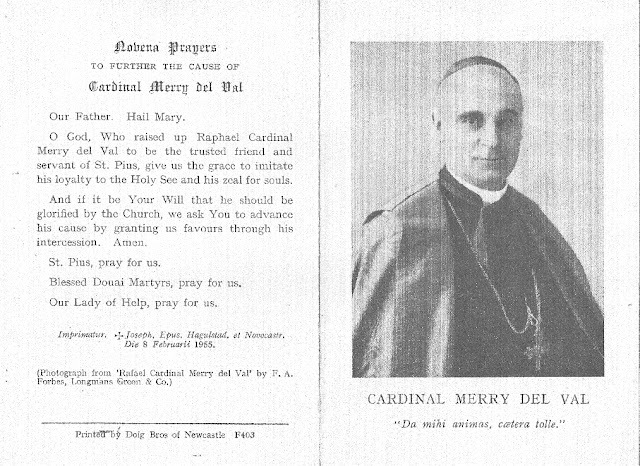 I have attached scans of the bishop’s suggested novena prayers and a brief summary of Cardinal del Val’s life. Some of Rorate's readers may wish to recite these novena prayers to help the cause of this great servant of the Church. 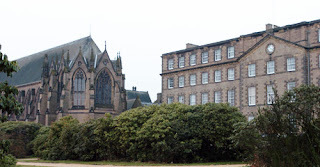 Ushaw College was the major seminary for the north of England and was formed in 1808 by students who had fled some years earlier from Douai College in northern France during the French Revolution. It expanded over the decades and by 1962, at the opening of the Second Vatican Council it housed 400 students, although some were secular students. It was ordaining about 22 priests per year. Following the introduction of the changes in the 1960s the numbers dropped quite dramatically and by 2010 there were less than 30 students. It was closed by the English hierarchy in June 2010. Is communion on the tongue unsanitary? …It is awkward for ministers to give communion on the tongue to people who are standing, which is the recommended posture for communion in Australia, and it is unhygienic because it is difficult for ministers to avoid passing saliva on to other communicants. This statement (often made by in-the-hand proponents) reveals an ignorance of the Roman Church’s traditional practice and the rubrics for the distribution of Holy Communion on the tongue. You know well, and We have frequently reminded you of it, nothing was so often and so carefully inculcated on His disciple by Jesus Christ as this precept of mutual charity as the one which contains all others. Christ called it the new commandment, His very own, and desired that it should be the sign of Christians by which they might be distinguished from all others; and on the eve of His death it was His last testament to His disciples to love one another and thus try to imitate the ineffable unity of the three Divine Persons in the Trinity. "That they may be one as we also are one ... that they may be made perfect in one". The Apostles, following in the steps of the divine Master, and conforming to His word and commands, were unceasing in their exhortation to the faithful: "Before all things have a constant mutual charity among yourselves". "But above all these things have charity which is the bond of perfection". "Dearly beloved, let us love one another for charity is God." Our brethren of the first Christian ages faithfully observed these commands of Jesus Christ and the Apostles. They belonged to different and rival nations; yet they willingly forgot their causes of quarrel and lived in perfect concord, and such a union of hearts was in striking contrast with the deadly enmities by which human society was then consumed. What has already been said in favour of charity holds good for the inculcation of the pardoning of injuries which is no less solemnly commanded by the Lord: "But I say to you, love your enemies; do good to them that hate you; pray for those that persecute you and calumniate you, that you may be the children of your Father who is in Heaven, Who maketh His sun to rise upon the good and the bad". Hence that terribly severe warning of the Apostle St. John. "Whosoever hateth his brother is a murderer. 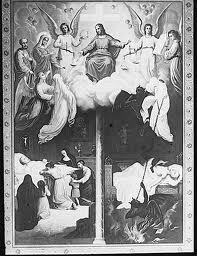 And you know that no murderer hath eternal life abiding in himself." Different styles of life and multiple scales of values arise from the diverse manner of using things, of laboring, of expressing oneself, of practicing religion, of forming customs, of establishing laws and juridic institutions, of cultivating the sciences, the arts and beauty. Thus the customs handed down to it form the patrimony proper to each human community. At 90, the Consolata Missionary Silvano Sabatini, who spent 40 years with the indigenous people of the Brazilian Amazon, has much to tell: about his "'rebellious' life on the edge," about his brave, stimulating, destabilizing "being with the Other," about the meaning of Mission, with all its tensions, contradictions, and complexities (in a moment in which the rethinking of the missionary activity of the Church seems very urgent and current). All that is in the book-testimony "The Anthropologist Priest. Amidst the indigenous people of the Amazon" (Ediesse, Roma 2011), written in collaboration with anthropologist Silvia Zaccaria, dedicated for several years to her field research with the indigenous people of the Brazilian Amazon. It is a project with a radical view of the evangelization that expresses itself in a unique way: "We do not baptize any Yanomani - Sabatini says - because we are convinced that it would make no sense to baptize a person outside the community, and that it is the culture that should be evangelized: man has the right to have his culture, and he must find in it the way to express himself christianly. Baptizing outside the community would have meant establishing a double personality in Baptism." 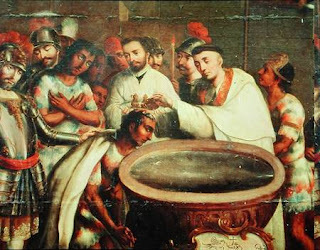 Which is why, Zaccaria says, "Sabatini responded thus that monsignor anxious to know how many Yanomami he had baptized: 'not a single one, thanks to the Good God.' 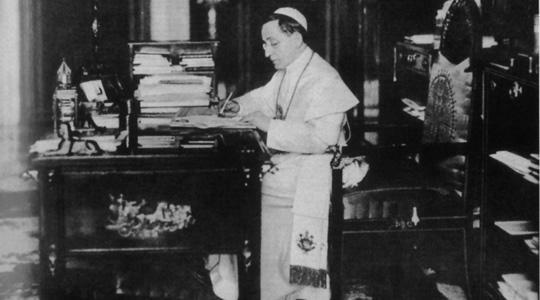 "
Through the manifest will of the Holy Father Leo XIII, young Rafael followed his studies in Rome at the Academy of the Noble Ecclesiastics. The aged Pontiff had perceived his intelligence and virtue and, notwithstanding the fact that he was still very young and not yet a priest, he entrusted him with important diplomatic duties in London and Berlin. But the soul of the future Secretary of State, far from the glitter of earthly glory, desired to receive the sacred unction which would make him a priest forever. During his stay at the College of Ushaw in England, young Rafael won everyone over, teachers as well as pupils, with his courteous and jovial character as well as his great intelligence and natural goodness, but even more for his supernatural and angelic piety which made of him one of the most illustrious glories of the famous College. In the spring of 1885, he received the tonsure and the four minor orders at Ushaw. 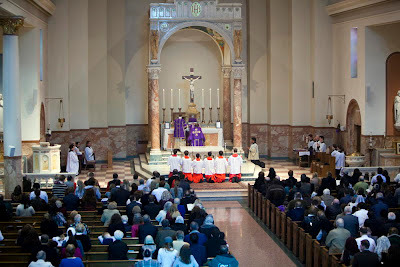 The first diocesan Solemn High Mass in Trenton since the implemention of the Novus Ordo was celebrated on Feb. 19 at the church of St. Anthony in Hamilton, New Jersey, with approximately 650 people in attendence. The celebrant was Fr. Brian Woodrow, the Deacon was Fr. Kevin Kimtis, and the Subdeacon was Fr. Todd Carter. All are diocesan priests who have been ordained in the past few years. Fr. Brian Woodrow has been given the responsibility by Bishop David M. O'Connell to promote the Extraordinary Form throughout the Diocese. Students from the nearby Westminster Choir College came to sing the Schubert Mass in G for the occasion. Weekly High Masses will continue at St. Anthony's at 12:15 on Sundays. Other images of the mass may be viewed here. For the record: a decision before summer? A decision on the Fraternity of Saint Pius X taken before summer? Rome, February 20, (Apic). 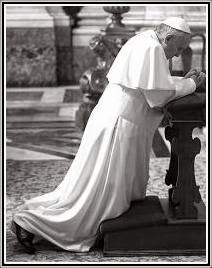 The matter of a return to full communion with the Catholic Church of the Society of Saint Pius X (FSSPX [SSPX]) is "in the Pope's hands", sources close to the dossier revealed to I.Media on February 20, 2012. Now that the phase of discussions with the Lefebvrists is over, Benedict XVI should shortly pronounce a final judgment to put an end, "before summer", to the discussions held since 2009 with the Society separated from Rome. 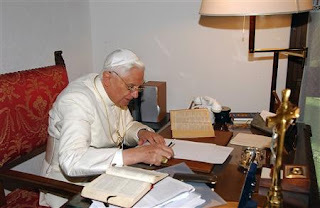 After having studied the response of the Society of Saint Pius X to the "doctrinal preamble", that had been handed to them at mid-September 2011, the Congregation for the Doctrine of the Faith now awaits the decision of Benedict XVI. "The stage of study and discussion is over, and we have reached the moment for decisions," it is indicated in the Vatican, underlining that, "all is currently in the hands of the Pope, who should deliver a final opinion." 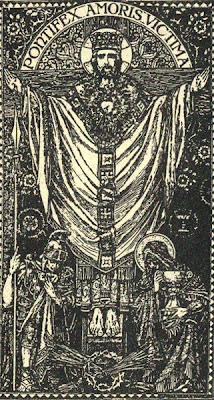 In ashes and in cilice - let us add our little grain of sand on the path of the Sacred Priestly Sacrifice of the Supreme Priest, His path to Jerusalem, Passion, and Death. Let us empty ourselves of our love for self and join the Love who loved us with His Most Precious Blood, each day present upon the Altar. A very fruitful Lent to all our readers, especially our dear Priests, who labor so deeply for our salvation. Thank you! Think of My suffering and that of the saints, and cease complaining. You have not yet resisted to the shedding of blood. What you suffer is very little compared with the great things they suffered who were so strongly tempted, so severely troubled, so tried and tormented in many ways. Well may you remember, therefore, the very painful woes of others, that you may bear your own little ones the more easily. And if they do not seem so small to you, examine if perhaps your impatience is not the cause of their apparent greatness; and whether they are great or small, try to bear them all patiently. The better you dispose yourself to suffer, the more wisely you act and the greater is the reward promised you. Thus you will suffer more easily if your mind and habits are diligently trained to it. Do not say: "I cannot bear this from such a man, nor should I suffer things of this kind, for he has done me a great wrong. He has accused me of many things of which I never thought. However, from someone else I will gladly suffer as much as I think I should." Such a thought is foolish, for it does not consider the virtue of patience or the One Who will reward it, but rather weighs the person and the offense committed. The man who will suffer only as much as seems good to him, who will accept suffering only from those from whom he is pleased to accept it, is not truly patient. For the truly patient man does not consider from whom the suffering comes, whether from a superior, an equal, or an inferior, whether from a good and holy person or from a perverse and unworthy one; but no matter how great an adversity befalls him, no matter how often it comes or from whom it comes, he accepts it gratefully from the hand of God, and counts it a great gain. For with God nothing that is suffered for His sake, no matter how small, can pass without reward. Be prepared for the fight, then, if you wish to gain the victory. Without struggle you cannot obtain the crown of patience, and if you refuse to suffer you are refusing the crown. But if you desire to be crowned, fight bravely and bear up patiently. Without labor there is no rest, and without fighting, no victory. The Apostolic Constitution Veterum Sapientia, of Pope Blessed John XXIII, on the fostering of Latin studies, reaches its fiftieth anniversary today, Feb. 22, 2012. The words of Romano Amerio appropriately convey the meaning of this Apostolic Constitution, the most readily forgotten papal document in the history of the Church. If there will ever be a "Hermeneutic of Continuity", it is to be based on the unchangeable Tradition of the Church and on the clear signs left by Pope John XXIII in the conclusions of the Roman Synod conducted entirely by him, and in Veterum Sapientia. Pope John intended the council to be a great act of renewal and functional adaptation for the Church and thought he had adequately prepared it to be such, but nonetheless cherished the prospect that it would all be over within a few months; thinking perhaps of Lateran I under Callistus II in 1123, which three hundred prelates concluded in nineteen days, or of Lateran II under Innocent II in 1139, which a thousand prelates concluded in seventeen days. In fact the council opened on 11 October 1962 and closed on 8 December 1965, thus lasting intermittently for three years. All expectations were overthrown because of the aborting of the council which had been prepared, and the successive elaboration of another quite different council which generated itself. The Roman synod was planned and summoned by John XXIII as a solemn forerunner of the larger gathering, which it was meant to prefigure and anticipate. The Pope himself said precisely that, to the clergy and faithful of Rome in an allocution of 29 June 1960. Because of that intention, the synod’s importance was universally recognized as extending beyond the diocese of Rome to the whole Catholic world. Its importance was compared to that which the provincial synods held by St. Charles Borromeo had had with respect to the Council of Trent. New life was given to the old saying that the whole Catholic world should wish to model itself on the Church of Rome. The fact that the Pope immediately ordered the texts of the Roman synod to be translated into Italian and all the principal languages, also makes it clear that in his mind it was intended to play an important exemplary role. The texts of the Roman synod promulgated on 25, 26 and 27 January 1960 constitute a complete reversion of the Church to its proper nature; we mean not merely to its supernatural essence (that can never be lost) but to its historical nature, a returning of the institution to its principles, as Machiavelli put it. The synod in fact proposed a vigorous restoration at every level of ecclesial life. The discipline of the clergy was modeled on the traditional pattern formulated at the Council of Trent, and based on two principles which had always been accepted and practiced. The first is that of the peculiar character of the person consecrated to God, supernaturally enabled to do Christ’s work, and thus clearly separated from the laity (sacred means separate). The second, which follows from the first, is that of an ascetical education and a sacrificial life, which is the differentiating mark of the clergy as a body, though individuals can take up an ascetical life in the lay state. The synod therefore prescribed for the clergy a whole style of behavior quite distinct from that of laymen. That style demands ecclesiastical dress, sobriety in diet, the avoiding of public entertainments and a flight from profane things. The distinct character of the clergy’s cultural formation was also reaffirmed, and the outlines were given of the system which the Pope solemnly sanctioned the year after in Veterum Sapientia. The Pope also ordered that the Catechism of the Council of Trent should be republished, but the order was ignored. It was not until 1981 that, by private initiative, a translation was published in Italy. The other day we brought you, via our friends at Audio Sancto, a hard-charging traditional Lenten Mission delivered by Fr. Isaac Mary Relyea (listen here). 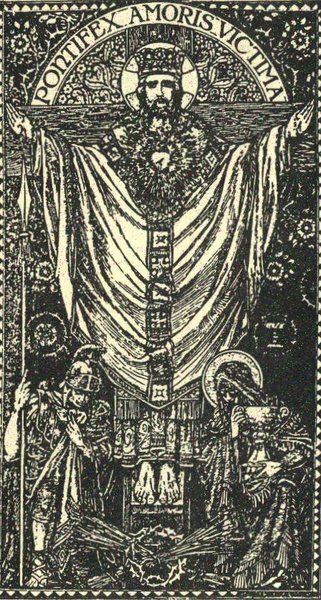 With Ash Wednesday on the horizon, we bring you one last traditional Lenten Mission (by a priest of the FSSP), since they are nearly extinct outside of fully traditional Mass sites. Lent is coming. The time to prepare is coming to an end. Every existential journey is worthy of respect, especially, if is has been marked by suffering, but the one who has transformed his positions has no right to accuse another (in this case Mons. Gherardini) who has remained coherent, of being ‘ambiguous’ or ‘vague.’ Furthermore, nobody has the right to substitute the supreme authority of the Church in judging their brothers on questions of faith which are still undefined. There are some dogmas, such as the Immaculate Conception, that are infallibly defined by the extraordinary Magisterium of the Church. Whoever denies them, should be considered, without question, a heretic. There are other truths of a theological order, such as that of the invalidity of the ordination of women to the priesthood which cannot be denied without falling into heresy or error, because, never having been defined by the extraordinary Magisterium, they have been proposed infallibly by the ordinary universal teaching authority of the Church. Nevertheless, there are other points in which theological discussion is open, for example, of attributing theological merit to the declaration of religious liberty (Dignitatis Humanae) or to the liturgical reform of Paul VI. In these cases the extraordinary Magisterium has never made any declaration and the conditions required by Vatican I for the infallibility of the ordinary Magisterium are missing. Thus, discussions here, are free and wide open. The Church throughout Her history, has always acknowledged theological disputes, even heated ones. Until a truth has been defined as such by the Church, it is licit to defend ones’ own opinion, even passionately, because we have the duty to sustain that which we believe to be true. We have no right, however, to “excommunicate” whoever thinks differently from us, just because we do not share their opinions. If Mons. Gherardini, Fr. 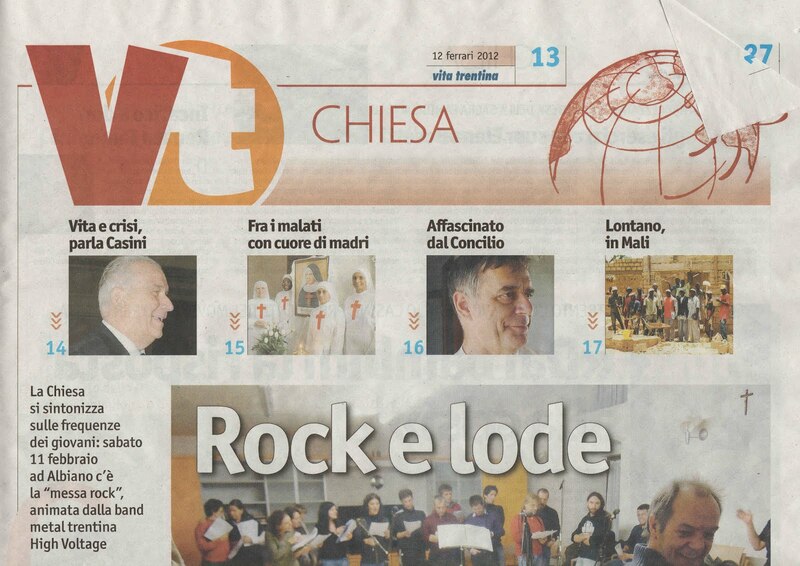 Lanzetta or Professor de Mattei are in error, let the Church Herself condemn them. But if Mons. Gherardini lives in the Vatican and writes for “L'Osservatore Romano”, it means that his opinions, even if not necessarily shared, are at least tolerated by the ecclesiastical authorities. And how can they not be, when positions that are objectively heretical are tolerated, such as the Austrian or German parish-priests that demand the ordination of women and also married priests? It is no surprise that Mons. Gherardini’s positions are loathed by the progressive front. But why is there such aversion from the part of one who is not progressive? Why is there so much focus on the one who defends Tradition instead of unifying all their forces in order to fight those who deny Tradition? In short, sharing some doctrinal positions, does not mean being an accomplice in canonical life choices. The great merit of Mons. Gherardini is actually that of demonstrating that a serious and objective criticism of some of the documents of the Second Vatican Council can be done, remaining fully inside the Catholic Church, respecting the supreme Authority and leaving it with the task of resolving the question in a definitive manner. Until this happens, discussions are licit and should take place in a calm and respectful way. One cannot be defined “sedevacantist” or “protestant” just because they have critically analyzed documents, acts or omissions by ecclesiastical authority not covered by infallibility, but those who deny, in principle or fact, the existence of this authority. This is not the case of Mons. Gherardini nor of the other authors under attack, who in other times would have been defined as “ultramontane” precisely because of their attachment to the Apostolic Authority and the Roman See. The accusations which have been launched at us wound our Catholic honour and constitute an unfair denigration which implies a sin against justice, and is grave. It is in the name of violated justice that I write these lines and ask that the terms of the discussion in act be modified. If the opposite happens, nobody will be able to take away our right to defend ourselves and we will find ourselves faced with painful controversies, but perhaps they will be purifying. 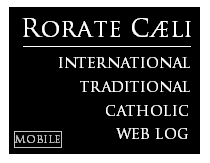 Rorate would like to note, as a matter of record, that Fr. Karl Joseph Becker S.J. , after having his name mysteriously removed from the list of those who would be created (with the announcement of a postponement for an undefined date in the future), was created a cardinal at today's Ordinary Public Consistory, with the diaconal title of San Giuliano Martire. (Photo source: Daylife) He looks quite healthy for his age. Recently, serious attacks have begun to appear against Mons. Brunero Gherardini’s theological reflections on the Second Vatican Council, as well as the history of that event which I, personally, have offered for examination. Discussions are never useless, but under the condition that they follow determined rules, beginning with the respect due to opinions which are different from our own. With regard to attacks directed at us, it seems, instead, that the violence and gratuitousness of the accusations, are proportionate to the meagerness of the arguments. Mons. Gherardini, myself and other gallant apologists, such as Father Serafino Lanzetta F.I., Alessandro Gnocchi and Mario Palmaro, are accused, on some web-sites, of being ‘crypto-sedevacantists’ and are lumped together with the Lutherans because of our ‘protestant mentality’ with ‘neo-agnostics pseudo-traditionalists’, with the progressives, which we would be united to because of our ‘individualistic pride’. I do not intend, for the moment, to respond to the accusations directed at me, but I sense it is my duty to intervene in defense of Mons. Brunero Gherardini, not only because of our friendship, but for the sake of justice. First of all, it should be kept in mind that the main target of these rash attacks, Mons. Gherardini, born in Prato in 1925, ordained to the priesthood in 1948, official of the then Sacred Congregation of Seminaries, after having had the responsibility of the regional and diocesan seminaries in Italy, was called to the Pontifical Lateran University, where from 1968, he taught as Professor of Ecclesiology and was Dean of the Theological Faculty. Pupil and close collaborator of Mons. Antonio Piolanti, he was a member in charge of the Roman Pontifical Theological Academy, and also of the Pontifical Academy of St. Thomas. He was Director of the magazine “Divinitas”, canon of the Patriarchal Basilica of St. Peter’s, and until the end of last year, Postulator for the cause of the canonization of Blessed Pius IX. Further, besides being a great theologian, he is noted for his exemplary priesthood, and has never incurred any theological or canonical censure by any ecclesiastical authority. 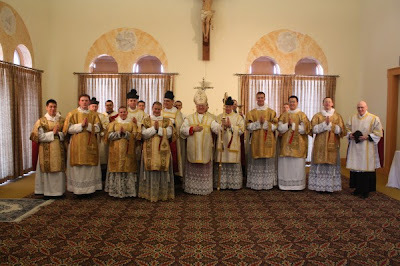 Below, please find the fifty-third posting of enrolled souls of the Rorate Caeli Purgatorial Society, which has 16 holy priests saying regular Traditional Latin Masses for the souls. Beside the exceptional and amiable figure of St. Pius X, we have, in marvellous splendor, the figure no less exceptional and extraordinary, of his Secretary of State, Cardinal Rafael Merry del Val. Of noble birth, but still more of noble aspirations, as from the first years of his life he had one unique and most noble goal: to be a Priest of God. Born on the 10th October 1865 in London, to the Spanish Marquis of Irish descent, Rafael Merry del Val, and to the Countess Josephine de Zulueta, English but of Spanish descent, the future Secretary of State received Baptism the following day, and was named Rafael. The prestigious Del Val family, illustrious due to the nobility of their blood no less than for their virtues, could boast that amongst their ancestors there was a martyr of the Church: Little St. Domingo del Val ... . The future Cardinal nourished a very special devotion to him. In the past, you could find a traditional Lenten Mission at many parishes. Now, unless you are near a traditional parish, they are nearly extinct. Fortunately, we are not meant to live in the past, we are meant to live in the now. And, now, we have the Internet. Our friends at Audio Sancto have a wonderful, traditional, five-part Lenten Mission by the holy and learned Fr. Isaac Mary Relyea. While it is not short, it does go by very quickly, and is easy to follow and understand. It's clear, concise and bold. As the season nears, you would do well to listen to this, to pray on it and to use it to prepare for a fruitful Lent. Australian Archdiocesan paper: Communion in the tongue is "unhygienic", disruptive and based on "over-emphasis on Christ's divinity"
The sanctuary of St. Stephen's Cathedral of the Roman Catholic Archdiocese of Brisbane. Source. Receiving communion on the tongue when the majority receive in the hand disrupts the unity that uniformity of posture and practice at Communion symbolises and builds. It is awkward for ministers to give communion on the tongue to people who are standing, which is the recommended posture for communion in Australia, (and it is unhygienic because it is difficult for ministers to avoid passing saliva on to other communicants. We now understand that Christ is present in several special ways at Mass apart from in the consecrated elements, for example in the assembly which gathers. We “touch” Christ in these other manifestations, so it would be inconsistent not to be able to take Christ under the form of bread in our hands. The bread which becomes the body of Christ is described in the liturgical texts as “work of human hands”. There is nothing unworthy about our hands. (Yet another reason to get rid of the Bugnini Offertory? - Augustinus) After all, we use them to do Christ’s work. As St Teresa said, “Christ has no other hands but yours”. For various reasons, we very rarely post long excerpts or full transcripts of articles published in large media outlets. In this case, we are forced to open an exception: the interviewer, a journalist in German daily Die Welt, is slightly more aware of what he is speaking about than the average mainstream journalist, and Father Franz Schmidberger, former Superior General of the Society of Saint Pius X (FSSPX / SSPX) and its current Superior for the German District, provides very specific answers. Let us hope all involved realize when the time has come to "go up to Jerusalem" (cf. Gospel for Quinquagesima Sunday). Translation by reader IM, adapted. "God will not let us fail"
The process of reconciliation between the Vatican and the SSPX enters a crucial phase. Three years ago, it emerged with the lifting of the excommunication of its four bishops in the headlines because one of them, British Bishop Williamson had denied the Holocaust. Now, it may be soon decided whether the attempt of the Pope to bring the ultra-conservative Catholics in the boat are successful, or whether there will be a definitive expulsion of the rebels of the full communion of the Roman Catholic Church. Her Superior General, Bishop Bernard Fellay, said in America that the latest proposal of Rome is unacceptable [Rorate note: this was not what Fellay said, but an outright deception planted by malicious Italian Vaticanists, as we said on the same day the sermon was publihed.] For Father Franz Schmidberger, the District Superior of the SSPX in Germany, matters do not sound so definitive. Paul Badde spoke with him. Die Welt: In Rome there are increasing signs that a full reconciliation with the SSPX may at last take place, and that they should soon have its own personal prelature, which is not unlike the status of Opus Dei. It is also mentioned, however, that negotiations between the Vatican and the SSPX have failed. Can you clarify it? 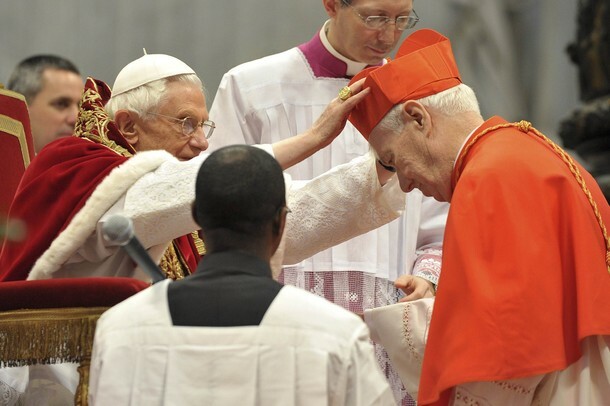 Father Franz Schmidberger: On September 14, 2011, Cardinal Levada presented Bishop Fellay, our Superior General, with a "doctrinal preamble", whose acceptance is the condition for a canonical recognition of the SSPX. We consulted extensively on the text and came to the conclusion that it was not acceptable. Finally, I myself, on December 1, brought the response of the Superior General to Rome, and, at a Roman request, he delivered a clarification of that response. Now we wait with great anticipation the response of the Congregation for the Doctrine of the Faith. Another reason not to call it the "Tridentine" Mass - in the Archdiocese of Trent, the chancery hates it. 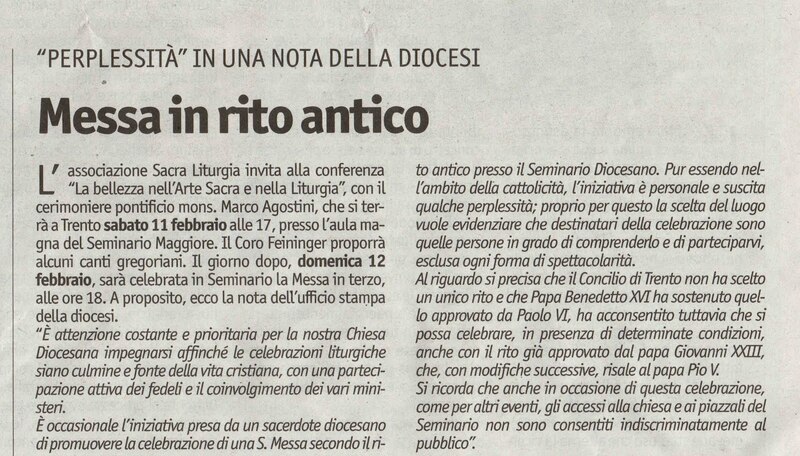 The Association "Sacra Liturgia" invites to the conference "Beauty in Sacred Art and in the Liturgy," with the pontifical ceremoniary Mons. Marco Agostini, which will take place in Trent on Saturday, February 11, at 1700, in the great hall of the Major Seminary. The Feininger Choir will present some Gregorian chants. On the following day, Sunday, February 12, the Mass will be celebrated in the Seminary, at 1800. 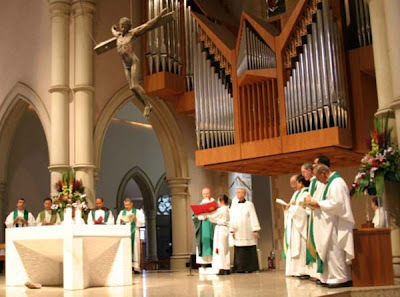 "It is the constant and prioritary concern of our Diocesan Church the effort that the liturgical celebrations be the summit and source of Christian life, with an active participation of the faithful, and convergence of the various ministries. 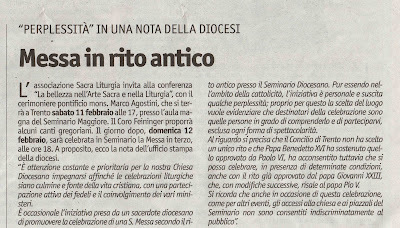 "The initiative, taken by a diocesan priest, of promoting the celebration of H. Mass according to the ancient rite in the Diocesan Seminary is occasional. Although within the scope of catholicity, the initiative is personal and brings forth some perplexity; precisely for this, the choice of place intends to make clear that those to whom the celebration is destined are those persons capable of understanding it and participating in it, any form of spectacle being excluded. "Regarding this, it is affirmed that the Council of Trent did not choose a single rite, and that Pope Benedict XVI has supported the one approved by Paul VI, but has consented that also the rite approved by Pope John XXIII, which, with successive modifications, dated from Pope Pius V, may be celebrated, in the presence of specific conditions. "It is recalled that, also on the occasion of this celebration, as for other events, access to the Seminary church and square is not indiscriminately granted to the public." 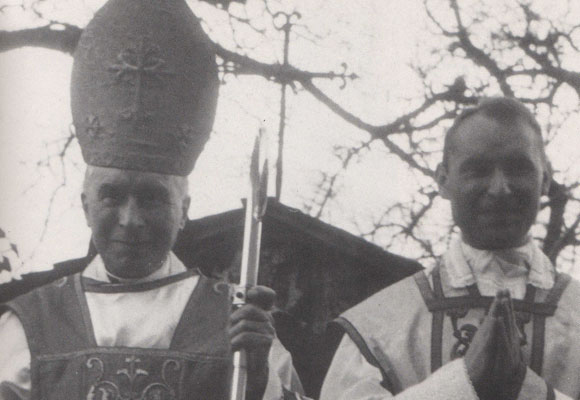 We are often accused of wishing to promote "scandal" by mentioning the shameful shenanigans which seem to be inseparable from the celebration of the "Ordinary Form of the Roman Rite", the Mass of Paul VI. Yes, we are fully aware that there are a handful of places around the world where it is celebrated "reverently", according to variable unpublished standards - but other kinds of celebrations have been part and parcel of this Rite from the beginning, and they are in most cases considered quite legitimate. In fact, they are promoted from the highest places, and are the ordinary part of Church life everywhere worldwide. Honestly, we are not the ones who cause scandal. The Archdiocesan Curia is, by publicly shaming a priest and faithful who are merely exercizing their (literally) God-given papally-recognized rights, and limiting them - at the very same time they promote a "Metal Mass". Shame on the Trent Curia: vergogna! !